1.1 For renting a car, the CLIENT has to possess a national or international driving license, valid for at least 1 year and to present identification documents and a valid credit card issued on its name. 1.2 The international driving license is mandatory if the CLIENT possess a driving license in another writing than the Latin alphabet. 1.3 To qualify for a standard car rental, the main driver and additional drivers have to be at least 23 years old and to have a driver license valid for at least 12 months. - If the main driver or additional drivers are younger than 23 years old ( from 18 to 22 years old) and have a valid driver license with minimum 12 months of experience, they can rent a car if they pay the “Young driver” fee of 4 EUR for each day of rental. The drivers that are older than 23 years, will not pay the “Young driver” fee. 1.4 For each rental you have a maximum limit of 200 km per day. 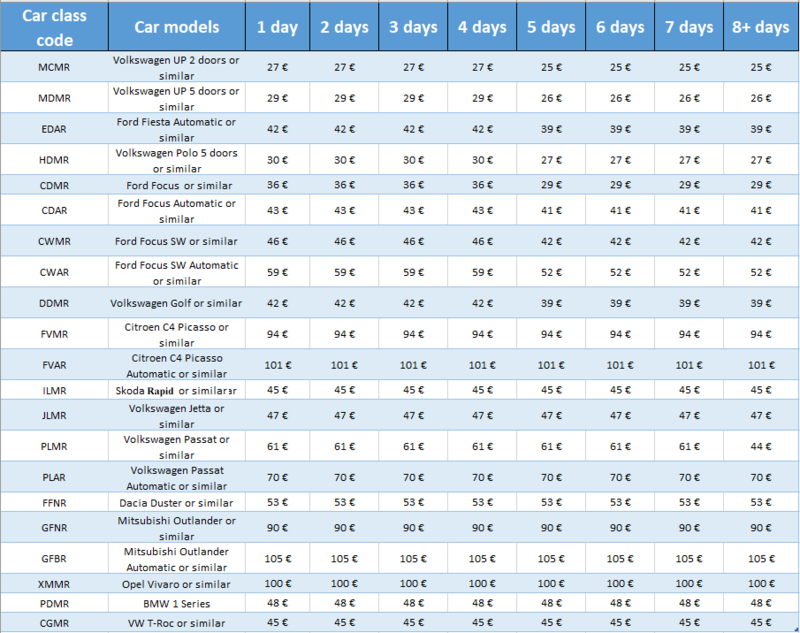 2.1 The fees are established and stated in EUR/day and they include: VAT,RCA Insurance (Compulsory Civil Liability Insurance for Motor), Rovinieta, Road Assistance with national coverage, the oil, Vehicle maintenance, suitable tires, depending on the season ( winter tires between 01 November – 31 March and summer tires between 01 April – 31 October), technical support 24h/24h. *** The above tariffs are for informational purposes only, as they may fluctuate depending on availability. For updated rates, please make a simulation with the specific dates on our site. 2.2 The rental fee does not include the following: fuel costs, road taxes (others than Rovinieta, included in the rental price), any fines received for not complying with the driving rules on public roads and the national legislation in force, bridge passing taxes, stationary taxes on airports, etc. The full payment of these amounts shall be incurred to the CLIENT. 2.3 The full payment can be made in advance, via bank transfer, on www.klasswagen.com website or at the signing of the rental Agreement by credit cards (VISA, MASTERCARD) in RON (for Romania) / HUF (for Hungary), calculated according to the Unicredit Bank exchange rate + 1% on payment day. a) If the date and time of pick-up is more than 24h than the cancellation date, the client will receive the full amount paid MINUS 20 euro that represents bank commission charges and logistical fees. b) If the date and time of the pick-up is less than 24h than the cancellation date, the pre-paid amount will NOT be refunded. Klasswagen will issue a credit voucher for the full pre-paid amount, wich the CLIENT can use at a future reservation . *If the CLIENT wants to cancel a reservation and block the amount paid in advance for a future reservation, we will issue a credit voucher for the full amount. All cancellations will be announced via e-mail at reservations@klasswagen.com or by clicking the "Cancel" from the "Manage my booking" email that the CLIENT has received. 2.4 The reservation of the Vehicle shall be considered certain only after the CLIENT accepts the rental offer and after the CLIENT receives “the Reservation Confirmation” and the unique reservation code by e-mail. 2.5 The Reservation shall be confirmed for a class/category of vehicle and not for a specific vehicle. Klass Wagen cannot guarantee a specific trademark, model, motorization or color of the Vehicle. 2.6 Provided that at the time of the delivery, Klass Wagen does not have a vehicle available of the class for which it confirmed a reservation, it shall deliver a vehicle from the immediate superior class without additional costs for the CLIENT. delivery and returning of the Vehicle were mutually agreed by signing the Rental Agreement. 3.2 The rental car was handed to the customer with a copy of the original bead to prevent the commission of offenses. Klass Wagen SRL is committed to make available, on request, to any state institutions the original car bead within 48 hours. 3.3 The Vehicle shall be delivered in good functioning conditions, clean and hygienic, without any other dysfunctionalities and damages of the coachwork or interior than those emphasized on the “Delivery/Returning Paper” at “Delivery” section. 3.4 The CLIENT acknowledges and verifies the Vehicle’s situation before signing the Rental Agreement and any complaints regarding its situation shall be mandatoryly brought on delivery date and they shall be detained in the Delivery Paper/Returning of the Vehicle, at the “Delivery” section, the CLIENT being fully and directly responsible for any damage which has not been mentioned in the document mentioned above. Claims/objections regarding the Vehicle’s situation following the delivery are not acceptable. 3.5 The CLIENT undertakes to return the Vehicle together with all documents, keys, accessories and equipment in good condition (as they were taken over) at the place and time agreed in the Rental Agreement. 3.6 If there is a delay of more than three hours regarding the time specified for returning the Vehicle in the Rental Contract, the LESSOR reserves the right to inform the Police about the theft of the Vehicle, excepting the case when the CLIENT notifies KLASS WAGEN about its option of extending the Vehicle rental period. 3.7 If the Vehicle is returned by night or dirty and the identification of the eventual damages is impossible, the guarantee shall be relieved (reimbursed) within 2 business days after the LESSOR had all proper conditions for inspecting the Vehicle. 3.8 The Delivery and Returning of the Vehicle shall be done during the working program of KLASS WAGEN (08:00 AM – 06:00 PM). In case the Delivery or Returning takes place outside these hours or during the days qualified as public holidays a fee shall be perceived in amount of Euro 10 for every action of Delivery and Returning the Car outside the program hours and 25 Euros during legal holidays. 4.1 The CLIENT takes full responsibility (financial, civil and criminal) for the non-compliance of the using conditions provided in the Rental Contract. e) on roads flagged as closed to the public driving or loaded over the maximum admitted load or over the maximum number of persons as specified in the vehicle’s coupon. 4.3 The Vehicle shall be used exclusively on Romania’s territory, crossing the boarders being possible only in the case when the LESSOR gives its written consent through a document that stipulates expressly this, by paying down an additional fee per day (provided in the first page herein) for each day spent outside Romania. Outside Romania, KLASS WAGEN does not offer road assistance to the CLIENT. Consequently, this service is not included in the rental fee. The repatriation fee of the Vehicle to the Romanian border shall be entirely incurred to the CLIENT. Leaving the Romania’s territory with the rented Vehicle is possible only in the following countries, members of the European Union: Hungary, Bulgaria, Austria, Czech Republic, Slovakia, Greece, Former Yugoslav Republic of Macedonia(FYROM), Croatia, Serbia, Slovenia, Montenegro. Taking into consideration that the Cross Border service is not available for all categories of vehicles, the CLIENT declares that he has verified the availability of this service before confirming the reservation. If the car was rented from Hungary, leaving the territory of Hungary with the rented car can be done only in the following countries belonging to the European Union: Poland, Austria, Slovakia, Czech Republic, Bulgaria, Romania, Serbia, Greece, Montenegro, Former Yugoslav Republic of Macedonia (FYROM), Croatia. 4.4 The Vehicle can be driven only by the signing person of this Agreement or only by a specified person herein and authorized by KLASS WAGEN. 4.5 The CLIENT shall not let under any circumstances the doors, windows, carrier or the vehicle itself opened and shall not let in any case the keys or vehicle documentation in the Vehicle. 4.6 In case of malfunction or any other damage, car repairs must be done by an authorized service location elected by the LESSOR only with consent of the LESSOR and in accordance with its instructions. 4.7 The CLIENT cannot in any circumstances sell or rent the Vehicle or place it as a gurantee. 4.8 In case of accident/incident or any malfunction, the Technical Assistance phone number is available NON-STOP 0040.374.779.709 and the CLIENT undertakes to inform without delay the LESSOR which will assist him and give all the instructions according to the situation. 5.1 The Vehicle is insured for damages caused to third parties during the period mentioned herein. By agreeing to the terms of the Rental Contract, the CLIENT accepts the terms and conditions of the insurance with the franchise (Collision Damage Waiver - CDW) contained in sections 4. and 6. and through which the financial responsibility is reduced regardless of the culpable party for producing the ensured event, to a mandatory minimum amount for theft or for damaging the rented Vehicle. The minimum mandatory amount represents the insurance franchise (excess) which is the equivalent of the guarantee, object of Section 6 below. 5.2 Personal insurance of the CLIENT, the passengers, the luggage or of any goods shall not be subject to the Rental Agreement and is not covered by the Vehicle insurance, the LESSOR being not responsible for any damage or deterioration of the above. 5.3 If, following the use of the Vehicle, any claims arise towards the LESSOR, the CLIENT shall exempt the LESSOR of any liability. The LESSOR shall not be liable for any damages or losses of the CLIENT and for any damages produced by CLIENT’s fault. 5.4 In case of accident, total or partial theft or destruction of the Vehicle by CLIENT’s fault (exclusive or mutual), action confirmed by the relevant authorities, the CLIENT shall be held liable with the amount retained as Guarantee, except the cases when the produced damages in case of accident, total or partial theft or destruction are not covered by the insurance policies, being expressly excluded and mentioned per se within the Rental Contract. 5.5 The Guarantee shall not be reimbursed or shall be refunded only partially in the expressed cases provided under art 6.4 herein. 5.6 The Guarantee may be formed as an insurance franchise for situations when insured risks occurs by CLIENT’s fault. The CLIENT is fully liable and has to pay all damages, costs and/or losses if the driver is under alcoholic or drugs influence, if the conditions provided by the Rental Agreement have not been observed as well as in the case when he does not present the necessary documents issued by the police (in case of theft, accident or any other incident). 5.7 In case of criminal offense, the CLIENT is civil, criminal and financial liable. In case of theft, if the CLIENT does not hand over the keys and the Vehicle’s documentation along with the theft proof (the record of findings) issued by the police, the CLIENT is fully liable: financial, civil and criminal, all the insurances losing their validity in this situation. 5.8 In case the Vehicle is not returned on the date stated in the Rental Agreement or in case of using it beyond the rental term, without a prior written approval in this regard from the LESOOR, the CLIENT shall be fully liable (financial, civil and criminal), undertaking to pay the Vehicle rental until the recovery or returning date and all the costs incurred to the LESSOR for the Vehicle recovery. This action constitutes criminal offense and shall be sanctioned according to the law in force. After the date provided by the Rental Agreement for returning the Vehicle plus one hour no insurance shall be valid anymore. 5.9 Non-compliance with the obligations mentioned in the above paragraph leads to termination of the insurance’s effect and the liability for the damages produced shall fully incur to the CLIENT, including the unrealized income during the period of immobilization of the Vehicle. KLASS WAGEN shall not be liable for anything than illegal actions committed by their fault by performing the service made available to the CLIENT except the cases when the damage has been caused by the CLIENT with intent or gross negligence or the damage has been caused by the heath state of the CLIENT or third party action. The damages caused by imprudence or negligence shall exonerate KLASS WAGEN of liability to the fullest extent possible and the CLIENT understands to be exclusively liable for damages caused directly or indirectly, partially or totally by the CLIENT’s behavior, renouncing to request any compensations from KLASS WAGEN. 6.1 On the signing of the Rental Agreement, the CLIENT has to block a Guarantee in amount between Euro 200 and Euro 2.000. 6.2 The blocked amount as Guarantee shall be established depending on the class of the reserved vehicle (category), highlighted within the Reservation Voucher (The Confirmation) and the Rental Agreement, the CLIENT being aware of the exact value of the Guarantee precedent to concluding the Rental Agreement, respectively even on the date when he elects the vehicle object of the Rental Agreement. a) the Vehicle has malfunctions or damages, scratches or damages of the paintwork, car body or interior (upholstery, board etc), bent wheel rims, cracked, defective tires or any other malfunctions and defects other than those highlighted on “Delivery/Returning Paper” at “Delivey” section. Quantification of the damages shall be realized by relative to the international online service EUROTAX and KLASS WAGEN has the obligation to make available to the CLIENT an excerpt of the report issued by EUROTAX in electronic format, by e-mail, at the address mentioned within this Agreement, precedent to the date when the necessary amounts for repairs were retained in accordance with EUROTAX report. The CLIENT declares that he consents with the utilization of this impartial way of quantification of the eventual damages. f) If the rental car is returned with damages, others then the ones those emphasized on the “Delivery/Returning Paper” at “Delivery” section, the customer must present at the car return the record of findings from the Police, Annex 2 (for the insurance company), as well as the Repair Authorization (all signed by the Police officer that wrote the finding record and the stamp of the Police section).If not respected, the entire deposit will be charged. To have the costs of food and accommodation or transport to home (only on Romania’s territory) covered, the CLIENT has to hand over on returning date of the Vehicle the Fiscal Bill representing the costs incurred with needs to mandotary be issued with the identification data of the KLASS WAGEN company mentioned within the Rental Agreement. If the CLIENT has purchased a Risk 0 Service and produced a damage/malfunction to the Vehicle initially rented, at the moment of receiving a replacement vehicle the CLIENT shall pay the equivalent or difference of the Risk 0 Service, as the case may be, for the new vehicle received at the rate specified in the Rental Agreement, otherwise KLASS WAGEN will block a standard Guarantee related to the class (category) of the Vehicle reserved. e) To obtain the record of findings from the Police, Annex 2 (for the insurance company), as well as the Repair Authorization (all signed by the Police officer that wrote the finding record and the stamp of the Police section). g) To hand over to the KLASS WAGEN representatives at the returning of the Vehicle the Affidavit of the accident/incident (available in the glove compartment of the Vehicle) filled according with the reality regarding the circumstances in which the incident with the rented Vehicle has occurred. 8.1 First hour of delay relative to the established hour for returning shall be free of charge. Exceeding with more than an hour shall be penalized with the equivalent of a day of renting, plus equivalent of the additional services according to the Rental Agreement at the rates set forth herein. 8.2 The Guarantee may be formed as an insurance franchise for situations in which the insured risks occurre only in the cases when the incident causes pertains to the CLIENT and/or is provoked by unknown authors except the case when the CLIENT pays the fee “Risk 0”, being no longer liable for the cases in which the fault of the damage/incident pertains, under the conditions described at Section 6. 8.3 The rental price and also the Guarantee are calculated based on the prices made available to the CLIENT within the Agreement and shall be paid in advance on delivery date of the Vehicle. The payment made on rental date cannot, under any circumstances, be used for extending the rental period. If the CLIENT wishes to prolong the rental period, he needs to obtain in advance the written approval of the LESSOR and to pay in advance any prolongation of the hereof. In case the CLIENT does not pay the bill on issuance date, the CLIENT shall also pay penalties in amount of 0.5% of the value of the bill per day of delay. 8.4 If the Vehicle is returned before the expiration term, the amounts paid in advance are not reimbursed. Because we appreciate our clients, in this case a voucher shall be issued equivalent to the value unused which may be used anytime at any of the KLASS WAGEN agencies. 8.5 Parking taxes, road taxes, fines or any other taxes shall be fully incurred to the CLIENT. 8.6 The fuel is not included within the rental price. The CLIENT shall return the Vehicle with the same quantity of fuel than the one with which it was delivered, highlighted within the Delivery/Returning Paper of the Vehicle, otherwise the CLIENT shall pay the equivalent of the missing fuel plus a fixed tax of refuel in amount of Euro 15. 8.7 The returning of the Vehicle excessively dirty compared to the initial state shall be sanctioned with a tax in amount of Euro 50.The notion of “excessively dirty” means the situation in which the Vehicle needs detailed cleaning of the interior,namely more than a simple washing procedure.For example:stained upholstery, traces of mud on board, chairs or bench,perishable leftovers in the Vehicle,but not into a trash bag, etc. 8.8 SMOKING IS STRICTLY FORBIDDEN in all vehicles rented by KLASS WAGEN. In case the Vehicle is returned with proofs which confirm smoking in the interior of the Vehicle, the CLIENT shall pay a penalty tax amounting Euro 124 to KLASS WAGEN. In case the Vehicle is set on fire or presents traces of burning even partially in the interior because of smoking, the CLIENT is fully LIABLE for the damages produced even if he purchased Risk 0 Service. The CLIENT shall pay all damages produced to the Vehicle, highlighted within the repair estimate issued by an authorized service, the administration fee (representing administrative costs as human resource, time, fuel, taxes and fees etc for management and settlement of the situation) and the immobilization period. The insurances of the Vehicle DO NOT COVER damages caused by smoking! 8.9 Other taxes and penalties: Loss of keys = 250€; Loss of the documents = 200€; Loss of the accessories = 70€; Refuse to fill the Affidavit of accident/incident (including the case when purchased Risk 0 Service) = 150€. In the case that the Vehicle is not returned at the time and place established under the Rental Agreement, the LESSOR (the CLIENT) shall incur full costs of recovering the Vehicle. Additionally to the recovery costs a penalty tax in amount of Euro 150 will be added. KLASS WAGEN reserves the right to further collect from the CLIENT’s credit card: penalties, taxes, damages produced to the Vehicle, missed fuel, fines, the period when the Vehicle was immobilized in service because of the produced damages (it will be calculated the number of days of immobilization X the rate as displayed on the website www.klasswagen.com, in 2.1 VEHICLE PAYMENT/ RESERVATION article) plus a fixed tax of administration in amount of Euro 85 (representing administrative costs as human resources, time, fuel, taxes and fees, etc for the management and settlement of the situation). By signing the Rental Agreement, the CLIENT acknowledges all terms and conditions of the Agreement and consents that KLASS WAGEN may collect from its credit card during 1 year from the signing of this Agreement, all amounts provided by the Rental Agreement, but only in the cases in which such amounts are due strictly in accordance with the contractual provisions. 9.1 Any dispute that appears during the performance of the Rental Agreement and cannot be solved amiably, shall be solved by the competent courts. 9.2 The CLIENT consents that the Rental Agreement is governed by the legislation in force in Romania and any legal action shall take place in Romania. The CLIENT consents that any additions or amendments to this terms and conditions are null and void if not convened in writing and signed by both parties. 10.1 The cases of force majeure shall be notified by the affected Party to the other Party within 3 business days from the occurrence. It shall be considered force majeure cases those unpredictable and unavoidable events irrespective of the fault of the Party that invokes it and which makes the obligations of this Party impossible to execute, for example: natural disasters, war, revolutions, embargo, public authority’s acts, etc. Proof of the force majeure case shall be made with the certificate of force majeure issued by the competent authorities. 10.2 If the force majeure continues for more than 20 business days, any of the Parties is entitled to request termination of the Agreement without the possibility for the other party to object, renouncing on the execution of the Agreement. In any case neither of the Parties have the right to claim compensation, but they have the obligation to execute all their obligations until the date when the force majeure case occurs. 10.3 “Fortuitous case” means a circumstance which has the origin in the activity area of the CLIENT or a circumstance of external origin which has no extraordinary character and may be predicted and prevented with the care and diligence of the most capable person. 11.1 KLASS WAGEN SRL („KLASS WAGEN”) will process the personal data provided by the CLIENT before or during the performance of the rental agreement in accordance with the applicable personal data protection legislation. 11.2 The categories of processed personal data. The categories of personal data processed by KLASS WAGEN in relation to the CLIENT differ depending on the stage of the performance of the rental agreement, however these will include: contact information (name, surname, home address, e-mail address, telephone number), identification information (identity card, passport, nationality, date of birth, driving license), bank account information, held credit/debit card. 11.4 As a data controller, we will take all technical security measures to protect the personal data provided by the CLIENT against unauthorized access, destruction or loss. However, we mention that this data will be made available to the competent public authorities, when this will be mandatory under the law. 11.5 The CLIENT will have the obligation to ensure that the provided personal data are accurate, up to date, and strictly limited to what KLASS WAGEN has requested in order to conclude and perform the AGREEMENT.